Devastated by the recent housing market crash and years of poor economic conditions, Stahelin Avenue was plagued by drugs, vacant homes, and burned down structures. Now, people ride their bikes down the street, Frederick says. Lots with abandoned homes have been converted into green space with a butterfly meadow, birdhouses, hydrangeas, roses, and picnic tables. The Detroit Institute of Arts even displayed artwork on the properties, and a ribbon-cutting ceremony was held for the street last year. Frederick is among hundreds of residents who have volunteered their time to clean up, beautify, and revitalize their neighborhood with the assistance of the Grandmont Rosedale Development Corporation (GRDC) and its Vacant Property Task Force throughout the last several years. The GRDC, a nonprofit that serves five neighborhoods in northwest Detroit, created the task force as a direct response to concerned residents who asked for help convening a group to address the foreclosures and vacancies in their communities. GRDC had already been renovating vacant homes and reselling them at fair market value to stabilize neighborhood housing prices. With the new task force of resident volunteers, they were also able to focus on property maintenance, code enforcement, and making sure homes weren’t blighted or open to trespassing, as well as foreclosure prevention efforts. The task force has been credited with contributing to higher property values compared to other similar neighborhoods that lack such dedicated efforts. Volunteers maintain lawns, plant flowers, and have even hung curtains and installed solar-powered motion-sensors on vacant properties. “Our communities are really good at hiding the fact that there are vacancies,” says Chelsea Neblett, program manager for the GRDC. Neblett, who lives in the area, didn’t even realize that the house next to hers was vacant when she purchased her home. There are 18 residents on the task force roster who regularly attend monthly meetings. Large cleanup events often attract 20 to 40 volunteers. While the task force is fortunate to have dedicated volunteers and has built relationships with various organizations and government departments, it still faces hurdles with funding and access to resources, Neblett says. The task force applies for grants and raises money through events like benefit performances and wreath sales, but it’s always looking for additional resources, funding, and volunteers. The task force advocates for the demolition of blighted properties and has worked with Detroit Future City’s Implementation Office to install landscaping that manages storm water runoff. It also partners with the United Community Housing Coalition and U-Snap-Bac to offer annual tax foreclosure prevention workshops to teach residents about assistance programs. The community started the year with 525 homes in danger of tax foreclosure, and 28 of them ended up on the auction list, she says. While tax foreclosure remains a threat, the community seems to have weathered the mortgage foreclosure crisis better than most. Research from the University of Michigan found that the Grandmont Rosedale communities stood out when looking at housing price changes in neighborhoods that had strong housing demand before 2007. According to Neblett, the GRDC coverage area has about 5,600 households, and the vacancy rate hovers between 5 and 10 percent. There were 363 vacant properties in November 2016, but many of these are likely in between owners or renters. There have been about 20 demolitions in the community. Neblett says there are a few bad actors who own multiple properties and contribute to blight and vacancy problems. The task force works with city on rental registries and requirements to make sure the properties are maintained to community standards. The task force’s longevity and productivity is a testament to the dedication of volunteers, especially those who have been involved since the beginning. 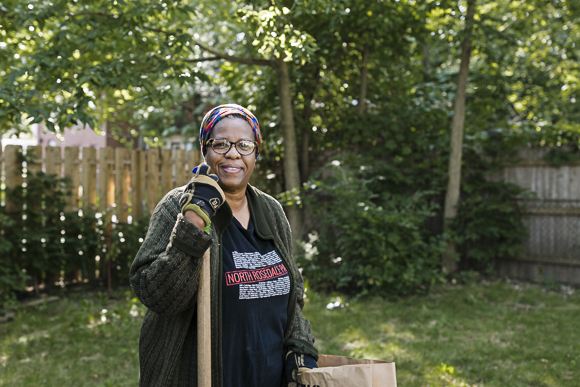 Volunteers like Frederick, who started taking care of vacant properties on her street in 2004, even before the task force had been formed. She’s lived in her home since 1985 and didn’t want to see the neighborhood fall into disrepair. So she and her husband took it upon themselves to perform cleanup and maintenance on about seven vacant homes.